Detectors long used to look at the cosmos are now part of X-ray experiments here on Earth. Modern cosmology experiments—such as the BICEP instruments and the Keck Array in Antarctica—rely on superconducting photon detectors to capture signals from the early universe. These detectors, called transition edge sensors, are kept at temperatures near absolute zero, at only tenths of a Kelvin. At this temperature, the “transition” between superconducting and normal states, the sensors function like an extremely sensitive thermometer. They are able to detect heat from cosmic microwave background radiation, the glow emitted after the Big Bang, which is only slightly warmer at around 3 Kelvin. Scientists also have been experimenting with these same detectors to catch a different form of light, says Dan Swetz, a scientist at the National Institute of Standards and Technology. These sensors also happen to work quite well as extremely sensitive X-ray detectors. NIST scientists, including Swetz, design and build the thin, superconducting sensors and turn them into pixelated arrays smaller than a penny. They construct an entire X-ray spectrometer system around those arrays, including a cryocooler, a refrigerator that can keep the detectors near absolute zero temperatures. 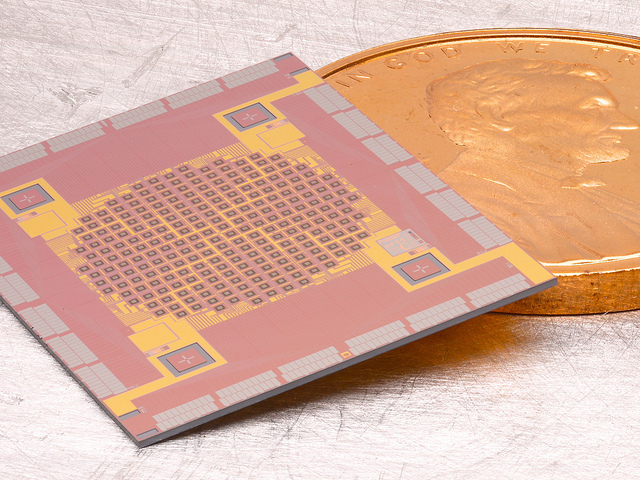 TES array and cover shown with penny coin for scale. Over the past several years, these X-ray spectrometers built at the NIST Boulder MicroFabrication Facility have been installed at three synchrotrons at US Department of Energy national laboratories: the National Synchrotron Light Source at Brookhaven National Laboratory, the Advanced Photon Source at Argonne National Laboratory and most recently at the Stanford Synchrotron Radiation Lightsource at SLAC National Accelerator Laboratory. Organizing the transition edge sensors into arrays made a more powerful detector. The prototype sensor—built in 1995—consisted of only one pixel. These early detectors had poor resolution, says physicist Kent Irwin of Stanford University and SLAC. He built the original single-pixel transition edge sensor as a postdoc. Like a camera, the detector can capture greater detail the more pixels it has. Each of the 240 pixels is designed to catch a single photon at a time. These detectors are efficient, says Irwin, collecting photons that may be missed with more conventional detectors. Spectroscopy experiments at synchrotrons examine subtle features of matter using X-rays. In these types of experiments, an X-ray beam is directed at a sample. Energy from the X-rays temporarily excites the electrons in the sample, and when the electrons return to their lower energy state, they release photons. The photons’ energy is distinctive for a given chemical element and contains detailed information about the electronic structure. As the transition edge sensor captures these photons, every individual pixel on the detector functions as a high-energy-resolution spectrometer, able to determine the energy of each photon collected. The researchers combine data from all the pixels and make note of the pattern of detected photons across the entire array and each of their energies. This energy spectrum reveals information about the molecule of interest. These spectrometers are 100 times more sensitive than standard spectrometers, says Dennis Nordlund, SLAC scientist and leader of the transition edge sensor project at SSRL. This allows a look at biological and chemical details at extremely low concentrations using soft (low-energy) X-rays. Nordlund and his colleagues—Sangjun Lee, a SLAC postdoctoral research fellow, and Jamie Titus, a Stanford University doctoral student (pictured above at SSRL, from left: Lee, Titus and Nordlund)—have already used the transition-edge-sensor spectrometer at SSRL to probe for nitrogen impurities in nanodiamonds and graphene, as well as closely examine the metal centers of proteins and bioenzymes, such as hemoglobin and photosystem II. The project at SLAC was developed with support by the Department of Energy’s Laboratory Directed Research and Development. The early experiments at Brookhaven looked at bonding and the chemical structure of nitrogen-bearing explosives. With the spectrometer at Argonne, a research team recently took scattering measurements on high-temperature superconducting materials. At NIST, Swetz says they’re working to pair these detectors with less intense light sources, which could enable researchers to do X-ray experiments in their personal labs. There are plans to build transition-edge-sensor spectrometers that will work in the higher energy hard X-ray region, which scientists at Argonne are working on for the next upgrade of Advanced Photon Source. To complement this, the SLAC and NIST collaboration is engineering spectrometers that will handle the high repetition rate of X-ray laser pulses such as LCLS-II, the next generation of the free-electron X-ray laser at SLAC. This will require faster readout systems. The goal is to create a transition-edge-sensor array with as many as 10,000 pixels that can capture more than 10,000 pulses per second. Irwin points out that the technology developed for synchrotrons, LCLS-II and future cosmic-microwave-background experiments provides shared benefit. “The information really keeps bouncing back and forth between X-ray science and cosmology,” Irwin says. Higgs search alumni: Where are they now? Meet four physicists who have found different ways to apply the skills they learned through their studies of the Higgs boson. A Fermilab technical specialist recently invented a device that could help alert oncoming trains to large vehicles stuck on the tracks. A project called A2D2 will explore new applications for compact linear accelerators. A humidity and temperature monitor developed for CMS finds a new home in Lebanon. While driven by the desire to pursue curiosity, fundamental investigations are the crucial first step to innovation. How can we measure the worth of scientific knowledge? Economic analysts give it a shot. The first synchrotron radiation source in the Middle East is running tests before its planned 2017 start. THE Port humanitarian hackathon at CERN brings people from multiple industries together to make the world a better place.